My friend told me of this series so last year I thought, alright why not start watching it. Let me just say Offrid you are one hell of a strong lady – You Go Girl! Basically the series begins somewhere in the future (not too far off from where we are). Diseases spread across the country/ countries which raised the rates of fertility problems. There’s been a civil war & the United states is now not called the “USA” but instead there’s a government-run by Christian theonomic ( correct me if I’m wrong but theonomy is when the state, society & church are all entwined. There is totalitarianism and all rules are those of the bible. However, they do reconstruct and add certain changes to these rules to fit in with “their standards of living” which is just… well lets move on). There’s this link to the series which is very closely similar to the Nazi reign where you see those power-hungry men who are egoistic, superior & stronger than everyone else, especially the woman. These ladies are subjugated & are just objects of pleasure for their husbands along with looking prep & pretty for their formal occasions – these newly formed rules restrict the ladies from owning property, dealing with money, unable to obtain a job & the worst thing is they are forbidden to learn to read. How absolutely inconceivable! So, amongst these ladies there are a few of them who are still fertile. These women are named “Handmaids”. Now here’s where its unbelievable. These ladies are assigned to different houses of the “elite gentlemen” who rule the country where they go through this deplorable ritual ( its horrendous to watch). They’re to carry the child for their “master and his wife” & after the birth they simply move onto another house like a piece of meat that’s been tossed. Again close to a despotic regime. Different colours are allotted to ladies of varying social status’. Handmaids wear red. Martha’s (who are housekeepers & cooks) wear green & the wives of the ruling elite wear blue. Now I’m a little confused with the Econowives who apparently are the lower class women are a mixture of all these ladies, they wear grey. Last but not least the awful aunts ( who train handmaids) wear brown. Eyes are basically spies/ secret police who keep all in check, informing hunters who track those down attempting to escape. Finally the ladies at the clubs who are solely for the men of the government – urgh hate those men, literally. ( I’m talking about the ones in the series of course but I wouldn’t be surprised if those in the real world from these status’ did the same – you know what I mean). 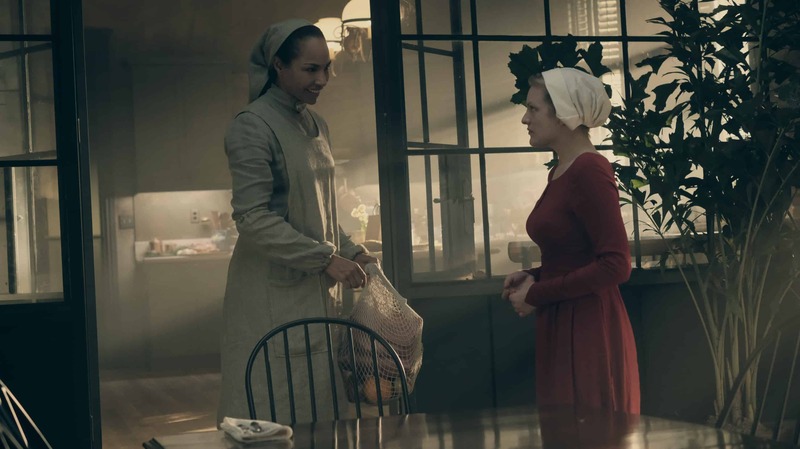 June Osborne, is the protagonist in this series, forced into becoming a handmaid she is renamed Offred. She is assigned to Gileadan Commander Fred Waterford ( the gorgeous Joseph Fiennes who I’ve had a crush on for ages but I can’t like him in this series, its soo dificult … boohoo) and his wife Serena Joy. Brutal punishments the resulted outcome for things that would normally be seen as not so bad or something that one should not get reprimanded for. There’s many themes delineated in the series. Things branch off one another. We view betrayal, love, lust. Conforming to a regime that is very similar to Nazism. One where there is totalitarianism, dictatorship and religion declared unto you in a forceful manner – which is in all honesty contradicting religion in itself as no one should be imposed by others into believing something they do not wish to. All views & opinions should be respected and even on those whom do not wish to follow. Season two is finally here, things are getting real. Offred has been sent somewhere, don’t know the location although it’s some sort of jail – she was caught whilst trying to escape. You see this stadium with some sort of gibbet ready to hang the handmaids. Again a punishment for them refusing to stone one handmaid who was condemned to death. Ohh I don’t want to give much away – you must watch it yourself the first two episode are out. But Offred is amazing, bold, stands up for the girls and knows what she wants – which is freedom. Someone kill that evil rat aunt Lydia.. PLEASE. Just DIEEEE – Wretched Witch! There was an Offred before me, she helped me find my way out. She’s dead, shes alive, she is me. We are handmaids.